Interested in starting your own blog? Don’t know where to start, how to drive traffic, or create an income? This is our first-year review of our blogging journey! In this article, I will lay out our best blogging tips we learned during our first year blogging that allowed me to quit my job and work full-time from home. Our first year was an incredible journey and I am so inspired and motivated to help others do the same. You get one chance at life! If you are not happy or always seem to be complaining about aspects of your life it’s time to make a change. Starting a blog can open up an unbelievable amount of doors for your future. Visualize your freedom, you can almost taste it already! So let’s get started! 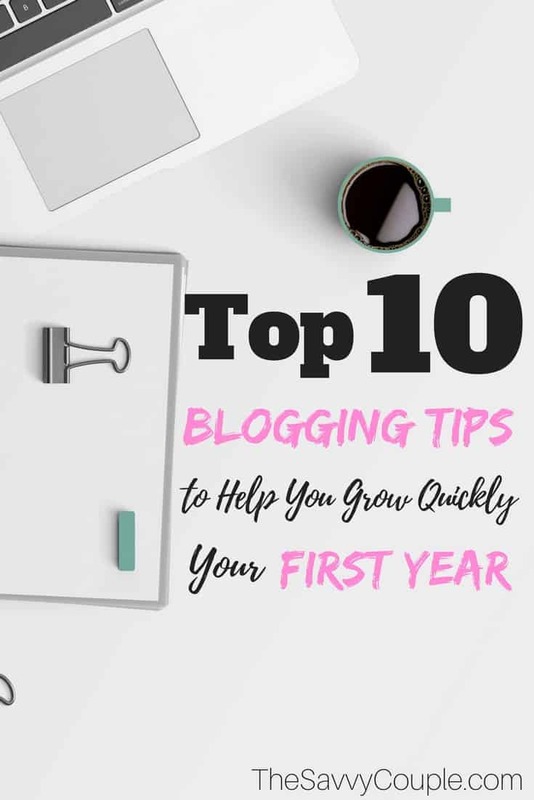 This is our top 10 list of blogging tips that will help you start, grow, and make money off your blog quickly. We highly recommend starting your blogging journey with Bluehost as your website hosting company. You can start your blog today for as little as $2.95 per month. What has been your biggest hurdle in starting your blog? If you have a blog what are your best blogging tips? Do you have a plan yet? Would you start a pizza shop without having a good plan in place beforehand? Even though starting a blog has a very low upfront cost it’s still important to not waste your time and money. Decide what you want to write about. This should be based on what you are passionate about. What could you talk about for hours on end? What are you an expert in? For us, personal finance was an easy choice. I went to school for finance and Brittany is as frugal as they come. We are obsessed with personal finance! Pick a niche you are passionate about and can see yourself writing content about for years to come. Blogging is not a get rich quick scheme it takes time and hard work. Understand your blog is not going to be a money making machine right out of the gates. Lesson: Find what you’re passionate about and create a long-term blogging plan. A good exercise to do starting out is sit down and write 100 blog post ideas off the top of your head. If you struggle to get 100 ideas, then reconsider the niche you want to start in. After you have found your niche, do some research! Before we started our blog, we took about a month following our favorite personal finance bloggers. Read what they are writing about, let it fuel your creativity! Start learning the in’s and out’s of what they are doing successfully. Humble yourself, don’t waste your time reinventing the wheel. We found Google, YouTube, and Pinterest to be gold mines for self-teaching ourselves. Lesson: Put on your learning cap and follow those that have been successful before you. This blogging tip could be the most important. I cannot overstate this enough, dive headfirst into the blogging community. We were so nervous to join groups and ask questions to successful bloggers, don’t be. The blogging community is INCREDIBLE. There is a weird feeling when starting your blog that everyone is your competition, this is completely false. The beauty of blogging is you have your own story, background, voice, thoughts, and opinions. Your creativity can be used in every aspect of your blog. The sooner you realize other bloggers are not your competition the faster you will see your blog grow. Be available, you are going to make some amazing blogging friends that will support you in along your journey. Lesson: Put yourself out there, ask for help, and be genuine. For many beginning bloggers, this is the hardest hurdle to get over before starting a blog. We can totally relate! It took us weeks upon weeks to find the right name. It’s important to take your time during this step, but don’t let it completely hold you back from starting. Using a tool like Name Checker can be a complete game changer. You will save so much time researching possible names with this tool. You will quickly be able to find out if your blogs domain name is available along with ALL related social media accounts. When starting your blog it’s important to make sure you can get all the social media accounts with the same name. This will ensure consistency and branding across all platforms. Lesson: Pick something short, simple, easy to remember, catchy, and related to your niche. “You miss every shot you don’t take” – Wayne Gretzky. Seriously! Do it already! Stop wasting more time. We regret not starting our blog sooner, especially me! I could have found my freedom years ago. Head over and read our step-by-step tutorial on starting a blog to get started now. We were both nervous about starting a blog and putting our lives out there. STOP caring what others think! The moment you can set yourself free of that fear is the moment you can completely change your life. You get ONE chance at life and no one should dictate it for you. Follow your dreams and use the God-given abilities that you have been blessed with. Lesson: Start your blog today like there is no tomorrow. Content, content, and more content! Another VERY important blogging tip. When it comes to blogging, content is king. With everything, you write make sure you are adding value to others, help them solve a problem. Take this article for example. Many people struggle to get their blog to grow after starting. My value or solution to this problem is sharing our best blogging tips we have learned over our first full year of blogging. The first few articles we wrote did not provide enough value to others, they were centered around us. If you want to be a successful blogger make your articles about your readers and help them as much as possible by solving their problems. Another savvy web tool we use to help create amazing “clickable” titles is Co-Schedules headline analyzer, it’s free! A good title is what drives individuals to click on your articles so it’s very important to create compelling titles. Lesson: Create content around what you love while helping solve others problems. One aspect of blogging that is often overlooked is actually investing in your blog. If you plan on turning your blog into a full-time income it’s important to treat it like a business from day one. We LOVE saving money, almost to a fault. Don’t try and cut too many corners when starting your blog. It’s important to get a good foundation to set you up for success. This includes a self-hosted WordPress blog, premium theme, and taking a course or two from the experts. The single most important course we have taken is Making Sense of Affiliate Marketing. After taking Michelle’s course we tripled our blogging income within a month of completing it. Her course is packed full of knowledge for bloggers to drive traffic and monetize your blog. For the price of the course, it’s a steal of a deal! There is even a bonus section for driving hundreds of thousands of visitors per month using Pinterest alone. To learn more about the course you can click here. Start off with a set amount of money you can use for your blog. Open up a business checking account to separate your finances from your personal accounts. This is important for legal reasons, but also to help easily track your profit and loss each month. Lesson: It’s worth investing in your blog to grow quickly. Having good quality images for your blog is a must. No one wants to go to a blog and look at ugly stretched out pixilated images. Some of the best sites we have found with FREE commercial use images are Pexels, Pixabay, Free Images, and Unsplash. Here is a list of our top 15 favorite free stock photo sites for bloggers to use. If you are good with a camera and can take your own images, go for it! You will find using stock images will only get you so far as many other bloggers are using the same images. Anytime you upload an image to your site make sure you add keywords into the “ATL” section when editing. It’s important for search engines to easily figure out what your images are being used for in your content. Lesson: Take time and find great images for ALL of your posts. Along with our first year of blogging, I read somewhere that blogging is 20% content creation and 80% marketing it. We found this to be very true! After you write your incredible article, how do you get eyeballs balls to come and read it? It’s important to understand that just writing articles and putting them on the internet will not get you noticed. Dedicate a majority of your time learning how to market your blog. We have found Pinterest is the best place to start for new bloggers. After that comes Facebook and SEO (search engine optimization). Instead of trying to learn a bunch of social media platforms at the same time, start with one and master it! This was something I was very hard headed about when we started. I figured I knew everything about all social media platforms, but they are all VERY different and take different strategies to be successful. Lesson: Create incredible content then market the crap out of it. Success will come with some hard work. Careful, once you get the taste of success like an article going viral it becomes addicting! Spend some time learning about Google analytics. 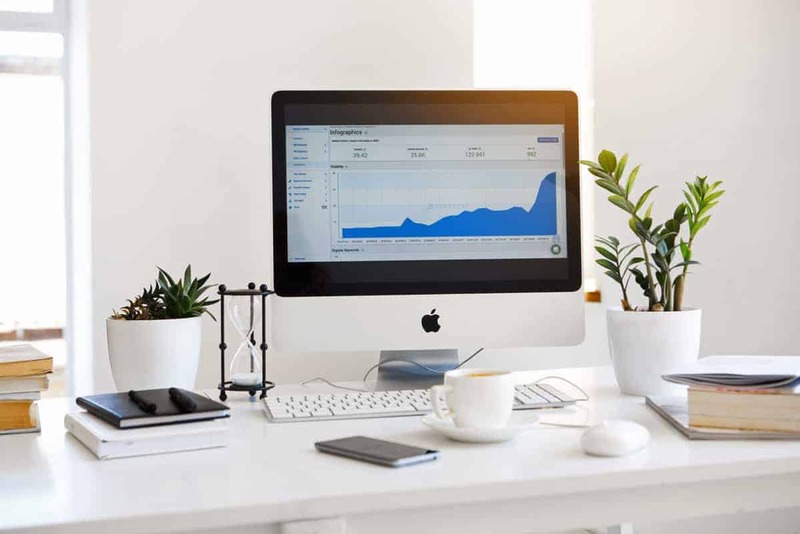 Understanding your website analytics can provide you with some invaluable information on what is working and what is not. You can find information like your where your visitors are coming from, demographics, time on page, popular posts, etc. Social media analytics are just as important as website analytics. The last thing you want to do is waste time on a social media platform that is not performing for you. A good example is Facebook Insights. These insights will provide you with information like which type of posts have the largest reach (Picture, Video, Link, etc). On Pinterest, you can find out which pins are being repinned the most and have the highest click through. Lesson: Understand your blogging analytics and use them to your advantage. I said it at the beginning and I will say it again, blogging is not a get rich quick scheme. It takes A LOT of hard work. We used to wake up at 5 am to get our posts out before heading to work. We would give up our weekends to create content and grow our social media followings. Our budget was reconfigured to free up extra money to go towards our blog. We grinded and sacrificed a lot our first year of blogging on just a hope and a dream. There were many days we questioned everything we were doing. You will doubt yourself as a blogger time and time again, it’s how you handle the doubt that will make you successful. I’m glad we stuck with it because we have months where we make over $10,000 from our blog. Understand that you are going to be on a long journey but it’s a journey that is absolutely incredible! Have grit through the entire process and nothing will stop you. Never give up and chase your dream for freedom. To your 6th point I read a post recently that really stuck with me where the blogger stated they always write with WIIFM in mind. What’s In It For Me – from the readers perspective. Writing great content is awesome but it also needs to be content that the reader can relate to or learn from. That’s what we are in the market of doing. Providing useful content for individuals to solve problems or make a better life. Yes don’t wait to figure it out. We learned our lesson about putting it on the back burner. Those are some really great tips! This year I invested in all that you listed as first year investments, except Tailwind. Tailwind has totally CHANGED our Pinterest game! Worth checking out. Thanks for leaving a comment. This is a great list of what to do! Especially the networking piece. Networking changed everything for me when it came to running an online business and having a blog. Also LOVE Tailwind!! Very inspiring list! Thank you! I never thought about doing a 100 posts thing, and I really need to sit down and see if I can! The 100 posts is an amazing tool to use. Let us know how it goes! Great post! I love all the information you gave about blogging! Glad you found it useful April! This is such great advice. I’m having to remind myself to keep going even on the hard days and to continue having grit. Grit will win the race! You got this keep grinding, it’s totally worth it! These are such great tips for a new blogger. Thanks! Glad you found them valuable. Some very good advice you have given. Guest posting is one of my favourites as its a great way to get your name and blog out there. Networking is so important! I really only started growing once I started reaching out and making other blogger friends. Great tips! Networking seems to be a HUGE step for any small business to take. Thanks for sharing these great tips. I will be using all on them to grow my blog. No problem glad you found them useful! Far and away my biggest hurdle is marketing. My social media numbers are pathetic given my traffic stats and email subscribers. I started a blog because I enjoy writing, but scheduling all the social media just feels like a chore. I’ve considered outsourcing the whole thing, but the few managers I’ve looked into charge astronomical prices. Very well detailed, quality content creation is a must if you are to grow, great share. This is a great post. As a newer blogger, sometimes I need to read things like this to keep me inspired and to give me confidence that if I keep at it something will come of it. Thank you. Absolutely some of the best traits you can have as a blogger are grit, determination, and patience. Keep plugging away and your time will come.